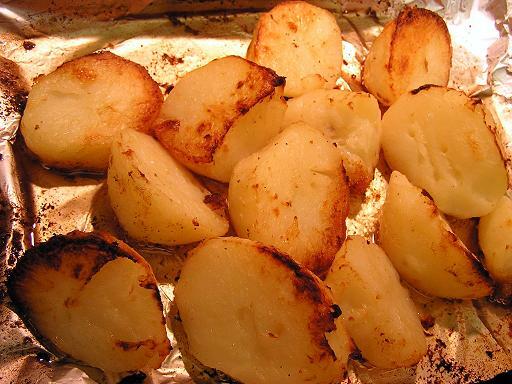 Roast potatoes are a popular style of oven cooked potatoes. In British cuisine, Irish cuisine, and American cuisine, they are sometimes eaten with roast meet. Particularly in the UK and Ireland, oven-roasted meat, with vegetables and roast potatoes, are the traditional Sunday meal. Peel the potatoes, and cut into wedges, or triangular chunks, no bigger than about 2 inches (5 centimeters) across. Toss the cut potatoes in a bowl with cooking oil (about 1 tablespoon per large potato). If using thyme, sprinkle with thyme (about ¼ teaspoon per large potato). Put the potatoes in a single layer, spread out, in baking pan. Put the baking pan in an oven which has been preheated to to 425°F (230°C; Gas Mark 8), and cook for 15 minutes. After 15 minutes, turn the potatoes, and cook for a further 15 minutes.